We have been planning a night away from home to take a trip to see some of the sights at Lake Tahoe. Tahoe lies about 200 mile east of us on the border between California and Nevada. John MacLatchie and his family live about half way at Granite Bay near Folsom lake so, today, we had arranged to call in on John, scrounge dinner and stay overnight in a nearby Howard Johnson’s hotel before continuing on tomorrow. Betty the cat would have to do without our company for a night. Naturally, Tomales awoke under its now familiar blanket of fog and it was taking a while to clear so we thought we’d make a day of our journey by driving into the sun zone to visit the Napa Valley en route. Things have changed somewhat over the 10 years since I was here. One of the changes that seems almost universal is that the wineries now charge, typically $5 or $10 depending upon range of wines, for their tastings. That can make a day long wine-tasting trip to Napa relatively expensive, for the non-driver, at least. Still, Napa is a picturesque valley and is well worth a visit. 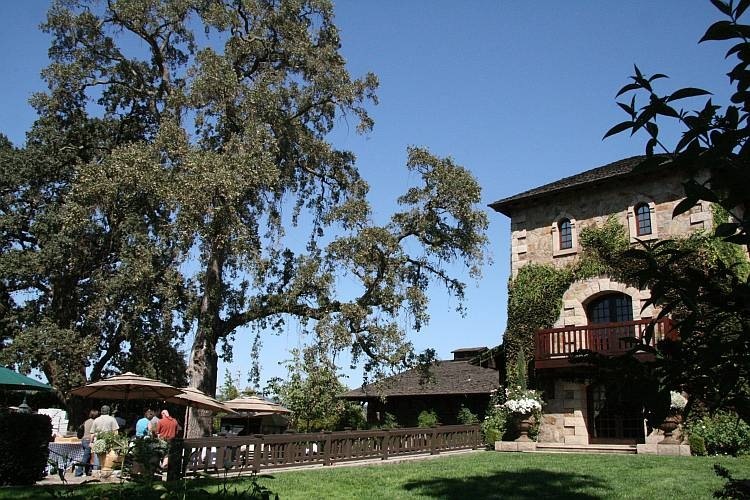 One of the things that has not changed is that the enterprising V. Sattui Winery, in addition to winery tours and tastings, still provides a tree-covered picnic area and a well provisioned deli on site. Our plan was to have a relaxing picnic lunch at Sattui and then drive on to Granite Bay to check in to our hotel and catch up with the MacLatchies. Softly-spoken Sue offered us a very cross-country route over the hills and down into the Napa Valley a little way north of the Sattui Winery at St Helena. The road down into the valley was an amazingly rural series of twists and turns and the car began filling with the alluring vinous scent of wine-making. ‘T is the season and harvesting and crushing is under way. The place smells absolutely wonderful. We arrived at Sattui at about midday before the main Sunday rush arrived. Having been surrounded by the smells of wine-making for the last half hour or so, our digestive juices were now running riot and could not wait to hit the deli. Amongst other things, there is a vast array of packaged cold meats and a large cheese counter. We found a good looking cheese loaf and selected some prosciutto, a small piece of Comté, and a slightly blue cheese intriguingly named Humboldt Fog. Naturally, we also selected one of the more reasonably-priced bottles of Sattui wine ($18!) to wash down our vitals. We waded through some very muddy grass (they apparently over-sprinkle it every day) to a spare bit of shady table and sat down to a particularly enjoyable picnic lunch. The car park was now filling rapidly and we sat and watched a stretched limo pull in and manoeuvre its way into a parking slot assisted by some Sattui staff. Stretched limos have for many years been a popular way to tour Napa to avoid the imbibing/driving conflict. While I was washing the mud of my Crocs and Carol was trying to snap an example or two of the surrounding red-winged blackbirds, the limo driver joined us at our table and sat down to his picnic lunch. We spent a little too long chatting with him about driving in general and driving stretched limos in particular before hitting the road to Granite Bay, according to Sue, 30 minutes too late to arrive by John’s suggested time of 3:00 PM. Oops! Rejecting the slower, more picturesque routes offered by Sue, we took the most direct route to Interstate 80 and headed east into the central valley. I used to be quite used to this drive but the traffic on I80 has increased dramatically since I last did it; we were nose to tail in all lanes. Every few miles the temperature indicated by the car’s on board thermometer bounced up a notch or two and eventually, as we approached Sacramento, we topped out at 100°F. Carol made an expensive international call on her UK mobile to the MacLatchies and warned them we’d be about 30 minutes late and eventually softly-spoken Sue guided us to the Howard Johnson’s to check in. The room was fine and, after a quick reprogramming, softly-spoken Sue had soon guided us another eight miles or so to John’s house where we could begin our reunion. John and Ann both now work for the state of California. Sometimes, when the state of California can agree its budget, they even get paid on time. In the central valley heat growing one’s own citrus fruits is not a problem and John had decided to try something new by making us a chicken tagine flavoured with some of his own lemons. It seems the tagine itself was a gift to John; it isn’t just me who enjoys receiving culinary presents, then? We pronounced the experiment very successful before retiring to the hotel early enough to allow both workers to prepare for their disturbingly early Monday morning. At last, a television that we could drive and it was showing back-to-back episodes of House. Yeah!